We didn’t sleep for very long last night and the very cold evening made it a little difficult to sleep soundly. Still, when all was said and done, we managed to leave Millaa Millaa at 6:50am. After some serious debate (actually more like arguing) with Julie, we (more like I) decided to press forward and give Blencoe Falls a try today. 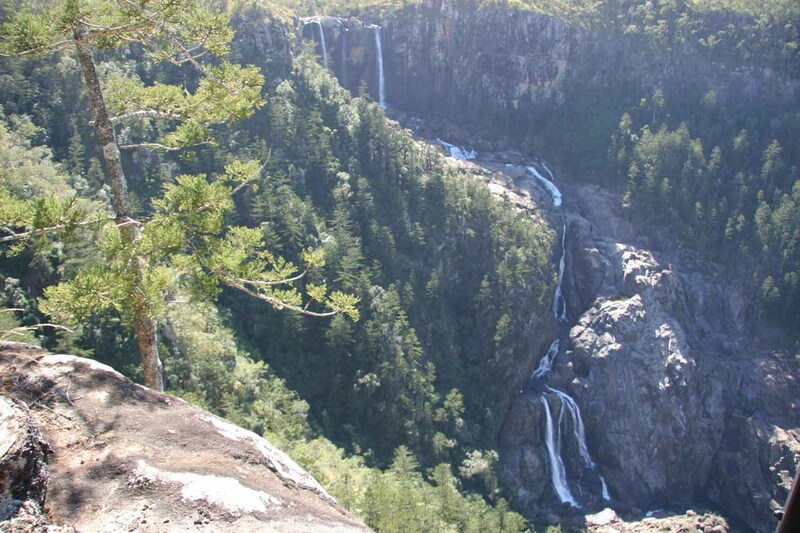 This was a bit of a last minute decision made yesterday when I realized from the Ravenshoe Visitor Centre that the Mt Garnett access to Blencoe Falls might seem possible in our 2wd vehicle (though there were no guarantees). I couldn’t live that down the regret of not seeing the falls and Julie knew it. Besides, I wasn’t sure when we’d return to Australia after this trip. So seize the moment, I say! 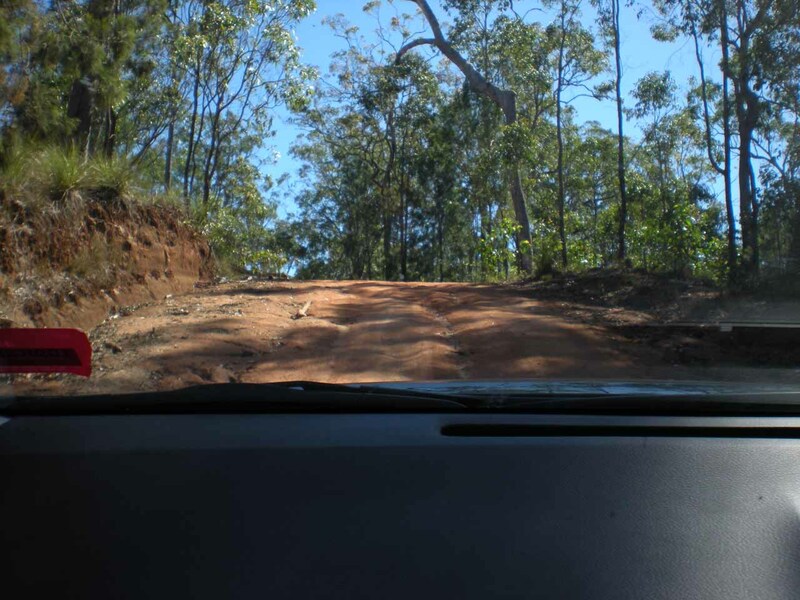 Anyhow, we were committed as we proceeded to head west then south past Ravenshoe and then through the dusty town of Mt Garnett as the tarmac road narrowed with unsealed shoulders for passing or for preventing head-on collisions. It kind of reminded me of the roads in Western Australia between Hyden (ala Wave Rock) and the outskirts of Perth. I had to admit it was a little bit of a gamble as the possibility of getting stuck was quite real, but I knew it hadn’t rained in these parts for a while and the weather seemed like it was ideal. 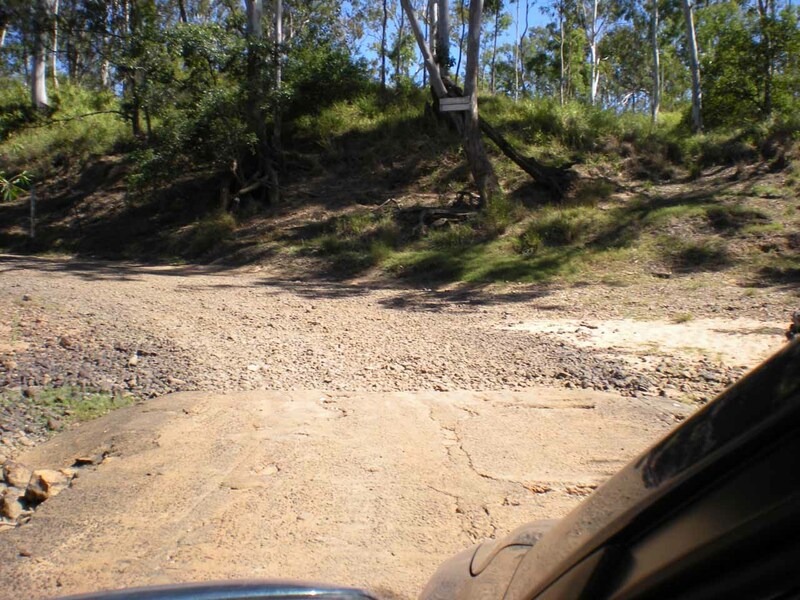 Anyways, we eventually got to the signed turnoff for Blencoe Falls just west of Mt Garnett. It was well over an hour from Millaa Millaa at this point, but Triple J Radio’s brekkie show kept us entertained during this time. The unsealed road was actually quite smooth and tame. I was rather surprised thinking the road would degenerate right away into tire-popping rutted dirt and gravel roads. But instead, it seemed rather smooth and it wasn’t difficult to maintain at least 60km/h. 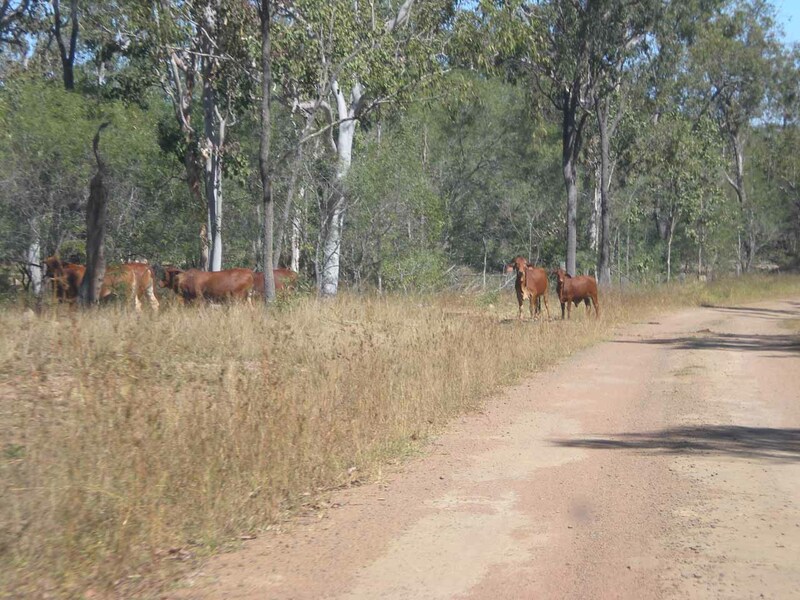 The GPS software was useless as it kept trying to guide us back to Kennedy (near Cardwell) then go west from there. Of course, we knew that wasn’t possible thanks to Cyclone Larry and from local advice from people in Cardwell. Probably after about 45 minutes or so, then the unsealed road started to get a bit dustier and rockier. Still, it wasn’t anything we hadn’t seen before with a 2wd. This whole stretch actually surprised us with wildlife sightings. I guess it was kind of a warmup to our African safaris in another few weeks. Besides the ubiquitous cows, we saw a couple of gray kangaroos, two wallabies, and even two emus! I guess there’s something to be said about the inverse relationship between the amount of development versus quantity of wildlife. And since we’re in Survivor Country, I guess it made sense that animal sightings like these were more frequent. We also saw a flattened area with lots of dead trees. I couldn’t say for sure, but I reckoned this must’ve been damage from Cyclone Larry in 2006. 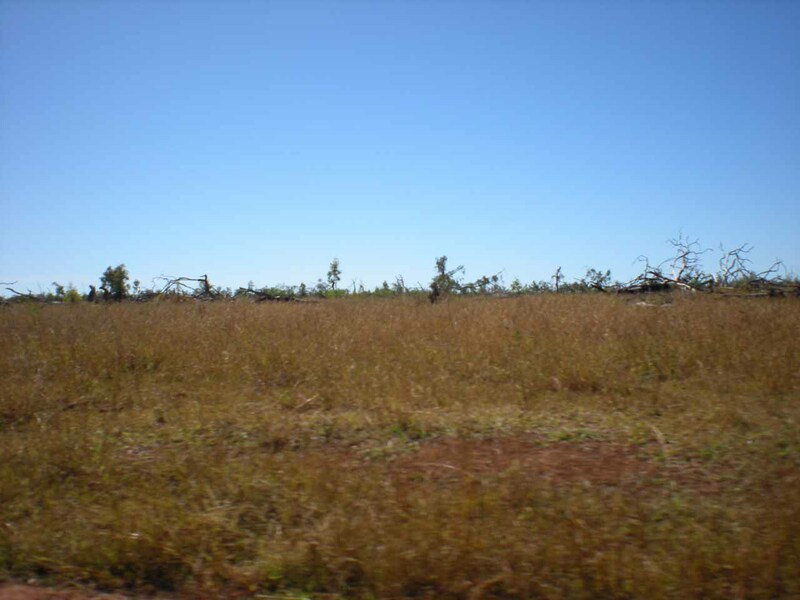 If so, this was just more evidence of the destructive power of that particular cyclone. At around 8:45am, we started to head east. That was when the road really started to throw curve balls at us. We got to a part where it seemed like a watercourse passed over the road. But with now being dry season, that watercourse was mostly rocks (more like minor boulders). That got me nervous as I wasn’t sure the Corolla could handle this. Still, we pressed forward and eventually made it past this obstacle (though we still had to face it on the way back out). The road seemed to be getting a little worse with a few mud puddles scattered about, but none of them got us stuck (though it seemed in a couple of instances that we could’ve been if we took the wrong approach). Still, we made it this far and we weren’t going to turn back. 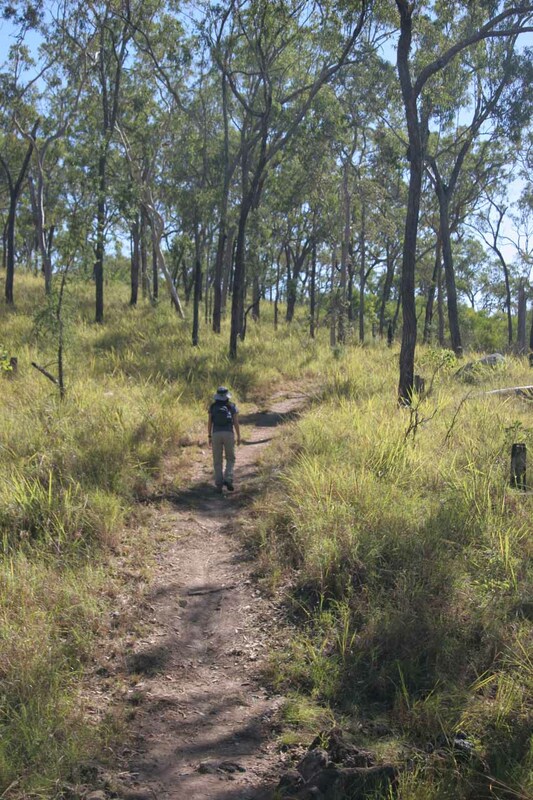 Plus, it was 5.2km away (10.4km round trip) so I doubted we were going to walk it. Looked like there was no choice but to press forward, and that I did. Right off the bat, the road narrowed more and the car rattled and bounced over the ruts, water channels, and washboards. Plus, there were a few big rocks we had to swerve around. Still, it wasn’t anything we couldn’t handle with care. 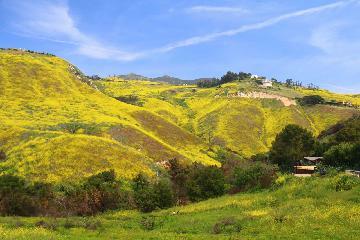 However, we ultimately got to a hill where the road descended fairly steeply. Just below the apex of the hill were more deep water channels. When we went down this part, the underside got scraped. Plus, I was a little worried about whether the car would make it back up this hill. Anyhow, we were committed at this point and we kept going forward. 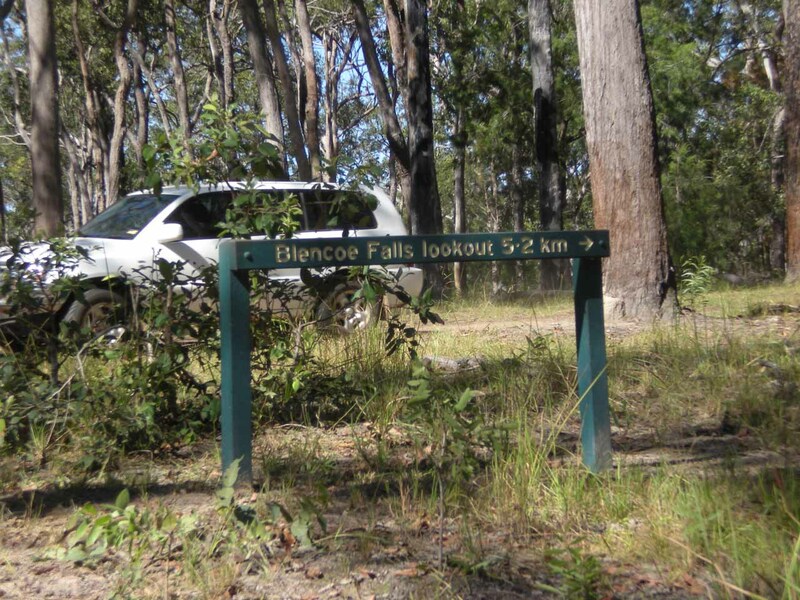 Mercifully at 9:50am, we finally made it to the car park for Blencoe Falls. 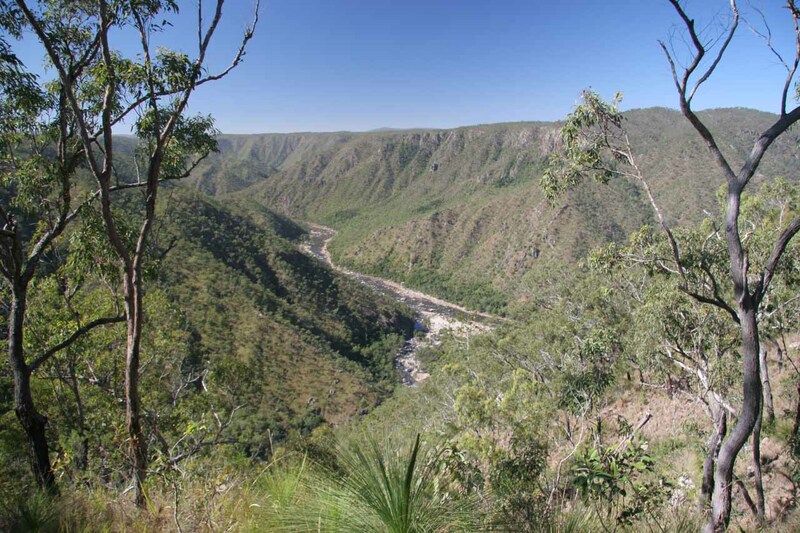 There was a nice panorama of the Herbert River Gorge in this relatively dry part of Queensland. 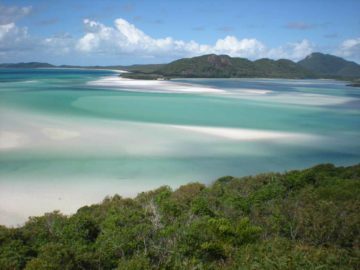 It contrasted mightily with the more humid, tropical environment of coastal Queensland. From there, I expected a long walk (2.7km) to get to the top of the falls, but Julie wasn’t keen on doing that and she insisted that we only go to the overlook, which was only 15-20 minutes away. 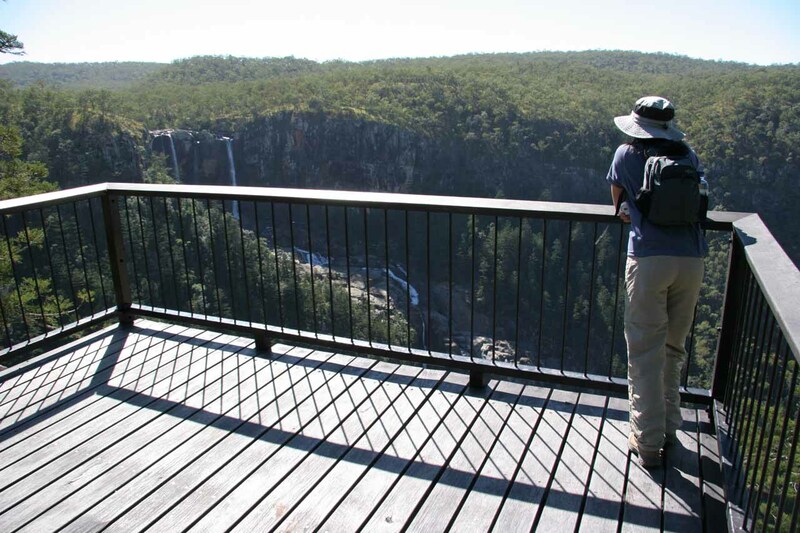 About 15 minutes later, we got to the lookout platform for Blencoe Falls. The sun was quite high up in the sky and very bright. We were somewhat looking against the sun. But given the trouble it took to get here, we weren’t going to wait out until late afternoon for better lighting. We still had to get to Cairns this evening. 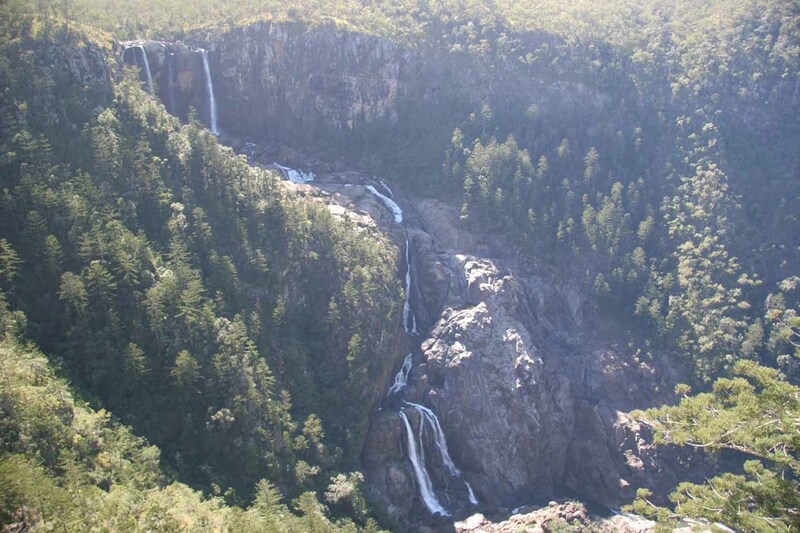 Blencoe Falls was quite impressive despite the lookout platform being a little distant from the falls. 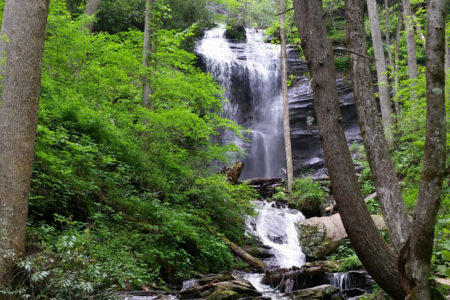 Still, we needed the distance to take in the whole falls in one shot. After all, it plunged vertically for 90m but then it cascaded for another 230m in height further below. 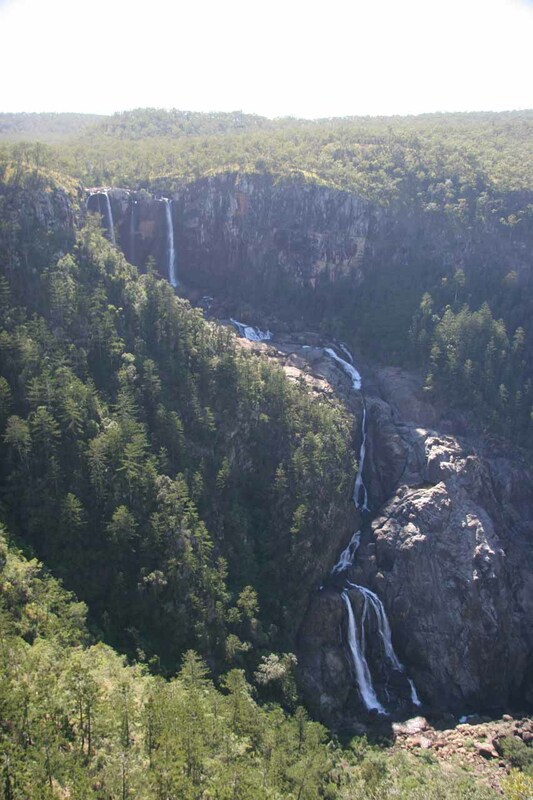 It definitely had a shape that was different from other Australian waterfalls we had seen before. We were joined by a lone Australian guy who also came by and took photos with us. Being this far away from civilization, it was a little reassuring that someone else was here in case we get stuck. At 10:30am, we returned to our car. We made it a point to leave before the Australian guy in his truck. That way if we got stuck on that hill I was worried about, he’d be behind us and be in a position to help. Anyways, I eventually got us over that hill, but not before scraping the undercarriage of the car once again on one of the deeper water channels. 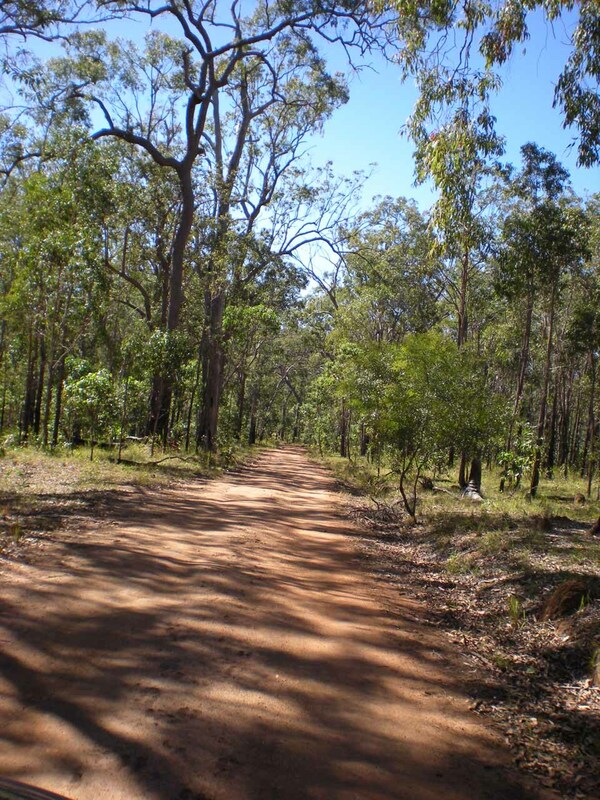 Mercifully, we made it out of that 5.2km 4wd stretch, but now we had to negotiate around 60+ km of unsealed road. Still, I knew that road was considerably easier than what we just went through. At this point, I started noticing something strange. It seemed that if the unsealed road wasn’t completely flat, something beneath the car seemed to catch the sand or dirt on the ground. I swore I never remembered something like this on the way in. But the thought started to cross my mind that perhaps I might have damaged something underneath the car. I didn’t want to believe that we damaged yet another rental car. Plus, we were in Survivor Country or deep in Queensland’s outback and this certainly wasn’t a place to get stuck. So I did a few more experiments where I tried to drive the car as normal (i.e. in the center of the road) even with dirt stacked up in the middle. And each time I did that, dirt would kick up underneath the car. “Oh really?” said I rather shocked. “Is this your own car?” asked he. “No it’s a hire car,” said I. The Australian guy gave us a sympathetic “sheesh” as he shook his head. He then took off as he was ready to set up camp at a spot not much farther away. This bit of bad news was a reality check for me so as he took off, I stopped the car, got out and looked at the underside for myself. Sure enough, there was a pretty weak, almost cardboard-like undercarriage that seemed to be there to protect the oil pan and the engine from accumulating contaminants (i.e. that dirt I was kicking up). I tried to push the hanging section back up, but it was clear that the protection thing was pulled off the screw that was holding it. We didn’t have duct tape (not that it would hold given how dusty it was down there) so we just had to make due with our suboptimal car. “Was your waterfall worth it?” asked a cheeky Julie. 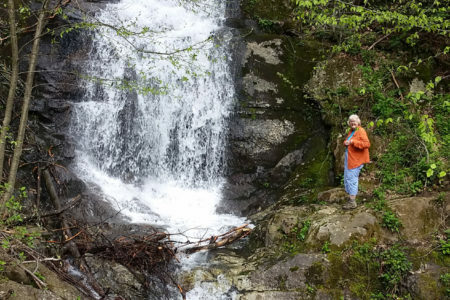 I didn’t say anything because we both knew I was determined to collect this waterfall and would regret it if we hadn’t done it. I had plenty of regrets from previous international trips (especially in Norway and New Zealand when we didn’t know better and regretted not seeing certain attractions). So now I shifted my driving strategy to drive off to the side with one wheel on the center of the road where the dirt accumulation was. It wasn’t the smoothest ride, but I at least minimized the amount of dust and sand getting kicked up by the hanging protective thing. It was around 1pm when we finally made it back to the Kennedy Highway. 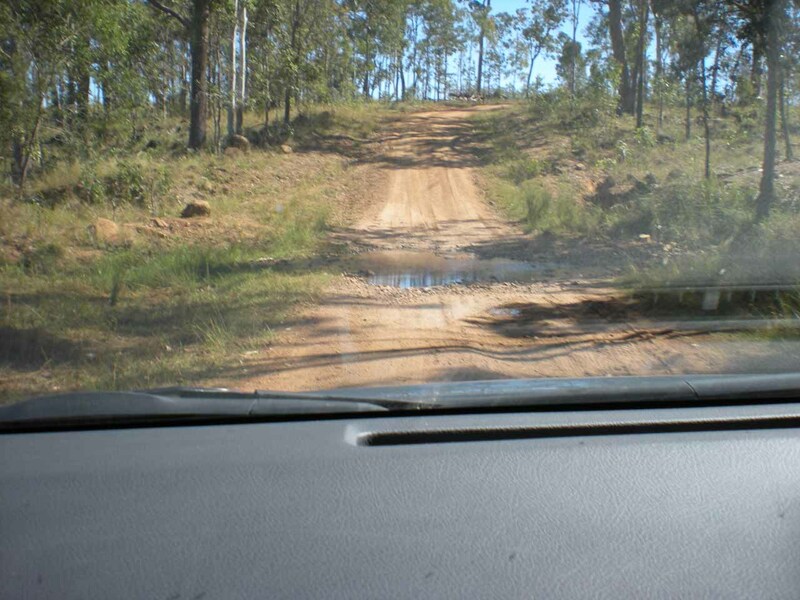 As we proceeded east past Mt Garnett and Ravenshoe, there were non-flat parts of the paved road and even that managed to scratch that hanging part of the car! The next several hours was pretty much spent driving straight for Cairns. We didn’t even stop for a Curtain Fig tree. Lake Tinaroo was also nearby, but I knew there was a hydroelectric dam here so we didn’t even bother visiting Tinaroo Falls. Eventually, we made it to our motel in Cairns. It was a good thing there was no more extensive planned driving for the remainder of our stay in Australia except for going to the airport from the motel on the very last day. Anyways, we were spending three nights here on mostly paid tours. 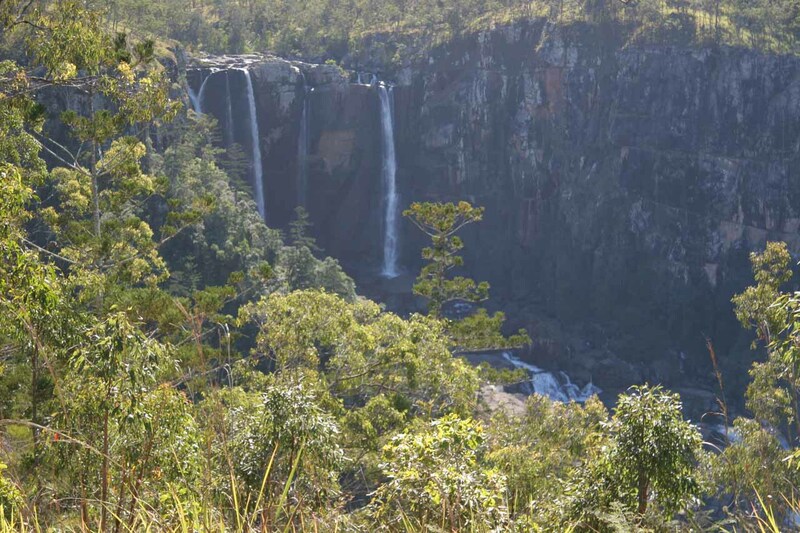 So I guess our Blencoe Falls mishap couldn’t have happened at a better time (considering it had to happen). We spent the rest of the evening walking around town and getting a feel for the place. It surprisingly wasn’t as hot and humid as I thought. In fact, it was actually rather a bit cool. Since we had to eat cheap given the weak dollar and the rather crazy dinner prices we saw for local food, we settled on eating at the food court in the night market for dinner. We managed to get our fast food Asian fix here. 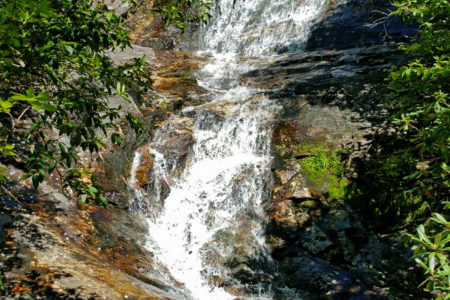 But perhaps more importantly, we had a sense of relief knowing that the majority of our waterfalling was done, and we managed to survive our excursion into Survivor Country.